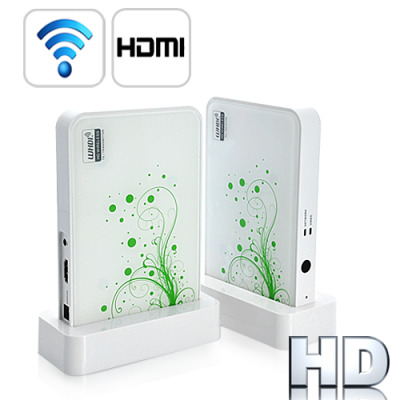 Successfully Added Wireless HDMI Extender (Transmitter Receiver System) to your Shopping Cart. Wires be gone, because one cable box and one cable line is all you need with the Wireless HDMI Extender (Transmitter Receiver System). Wirelessly streaming high-definition video and audio to any HDMI-supported source in your house, enhance your media entertainment experience with wireless HD that works. 1) Connect the wireless transmitter to your main audio/video source using the HDMI cable. 2) Connect the wireless receiver to any TV in any room using another HDMI cable. 3) That's it, you're done! Enjoy clear, high-definition wireless streaming! This Wireless HDMI Extender works up to 30 meters and will offer a maximum 1600 x 1200 resolution live stream to another room. Connect this to your TV set-top box (STB), DVD player, Playstation 3, Xbox 360, or any other HDMI output devices and view it from anywhere in the house! The Wireless HDMI Extender is available in our warehouse now for immediate orders. Why pay $1,000 for brand name devices when an equally high quality solution is here - Meet wireless HD that works at a price you can't pass up! Brought to you by Chinavasion, the leader in wholesale electronics.